In our eyes, taking care of your health in a holistic way is the cornerstone of well-being, and we believe everyone deserves access to therapies that work in this way. It is our mission to make this process as easy as possible, giving you the tools you need to remain happy and healthy. Not too long ago, it was very difficult for anyone seeking complementary therapy to find information or a professional who could support them. Being a team who between us have experienced various issues that could benefit from therapy, we know how it feels to be overwhelmed and lacking guidance in this industry. Through our own experiences, we have learnt how important having relevant information is and how the right support can help transform lives. Our journey inspired us to share what we have learnt along the way with others. Our team is passionate about finding happiness and we want to promote how beneficial complementary therapies can be. In 2005 we launched Counselling Directory, a website dedicated to promoting the benefits of talk therapy. While we continue to work closely with counsellors, psychotherapists and our visitors to ensure we are providing users with the very best service, after the success of the website, we considered the other ways people seek happiness and how else we can offer support. Our passion for health and wellness led us down the path of complementary therapy, where Therapy Directory was created. Therapy Directory is a website dedicated to offering a simple way to connect with therapists across the UK. You may have a health condition that could benefit from a form of therapy alongside medical treatment, or you may be looking for ways to reduce stress. You may simply be looking to better your overall well-being. Whatever your reason, know that it is all possible. Remember that support is available and you are not alone in this journey. We want to be the hand to guide you through these first steps to health and happiness. Alternative and complementary therapies are growing in popularity, and while it is positive that individuals are becoming more interested in wellness, there is much that is misunderstood. 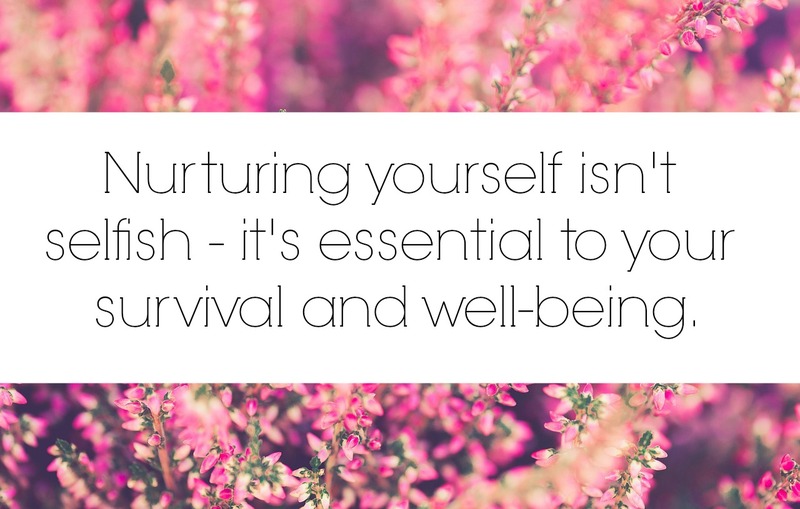 We understand that taking these first steps often takes time, to do the research, find a therapist and make contact - all of which can be daunting if you don’t know where to look, or what you are looking for. A nationwide database of qualified therapists. A Therapy Directory policy. This means all professionals are checked to ensure they provide evidence of qualifications or membership with a professional body before they can be listed with us, so you can be sure of contacting a credible professional. A detailed library of fact-sheets featuring useful information about various therapies available. Here you can learn more about how these types of therapies can benefit you on your journey. An FAQs section that looks to answer any questions you may have. An advanced search tool, which allows you to filter your therapist search according to your needs and location. Recent news and Expert articles, where you can find inspirational and informative posts about holistic healing and well-being. A local events section where you can find various workshops and courses to further your learning. Member profiles – our members pack their profiles full of information including background, fees, specialities and availability. This allows you to learn more about them and how they work before making contact. Therapy Directory has a number of sister sites, all with the same aim - to help people find support. From counselling and nutrition support to hypnotherapy and coaching, our network of directories seeks to cover all aspects of health and wellness. 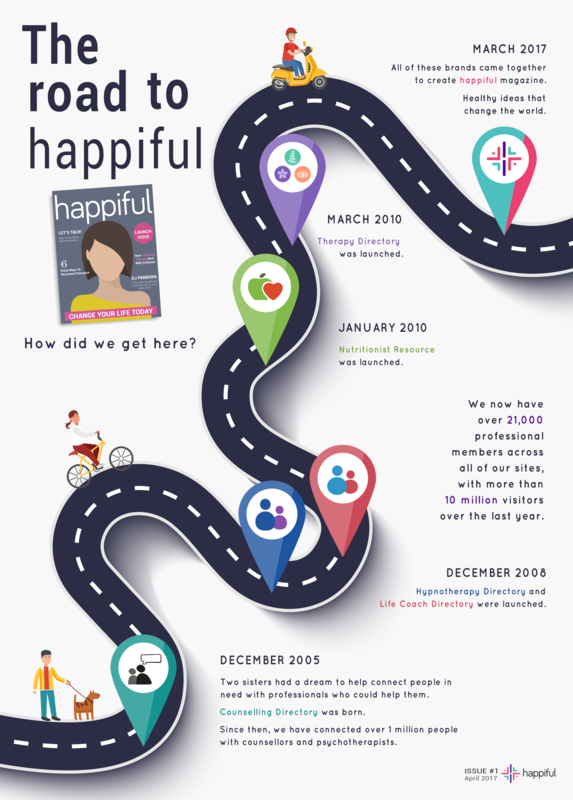 Bringing this all under one roof, on 20th March 2017 (International Day of Happiness) we launched Happiful. Our mission with this monthly magazine is to create a healthier, happier, more sustainable society while breaking the stigma of mental health. 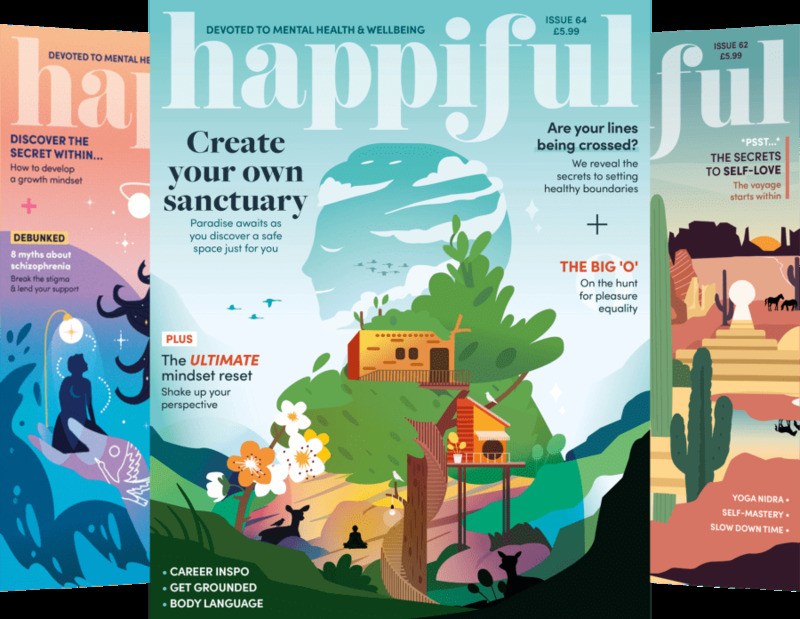 Each issue contains informative, inspiring and topical stories about health and well-being, from experts and those living with a variety of health conditions. We regularly feature holistic and complementary therapies, helping to promote alternative and natural treatments. Happiful shines a light on positivity and support that we feel should be available for everyone. We wouldn’t exist without you, the individuals seeking happiness and the therapists who share our dream of helping others. It is because of you that we feel it is so important to keep listening and acting upon your feedback. If you have any queries about how to use the website or how to become a member, please visit our Not sure where to start? section. If you would still like some guidance, fill out our contact form and a member of the Therapy Directory team will get back to you as soon as possible. To keep up to date with all the goings on here at Therapy Directory, connect with us on Facebook, Twitter and Google+.